Caption slip reads: "Photographer: Sandusky. Date: 1954-04-17. Assignment: Suicide with cyanide gas. 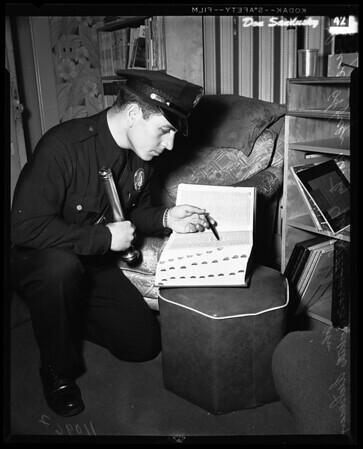 Officer Monty Gentile examines dictionary in front of John Crockett's apartment. Book is opened to page explaining lethal effects of cyanide compounds mixed with acid. Inside of closet into which John Crocket sealed himself. Note saucer containing acid and powder which Crockett mixed to produce lethal cyanide fumes".